East African Association was formed in 1922. The founder members were, Harry Thuku, Joseph Kang’ethe and Jesse Kariuki. It was started to address the complaints discussed in the previous section. It had members from Kenya, Uganda, Malawi and Tanganyika who were experiencing similar problems. It held its first public meeting on July 10, 1921. Its first chairman was Harry Thuku who was a friend of Desai. Desai was a publisher of an Asian newspaper called the East African Chronicle. Through the paper, they published their complaints. This way, they were able to reach people from other parts of the country. Later that year, another rally was held in Thika and that annoyed the colonial government. Harry Thuku was arrested in 1922 during an EAA committee meeting near the Norfolk Hotel in Nairobi. This caused a riot by the Africans. During the riot, the colonial police opened fire and killed many Africans. Harry Thuku was detained for nine years in Kismayu and the EAA was banned in 1923. This was the first powerful political party with membership throughout the region. This party was formed in 1921 by Harry Thuku and Abdalla Tariara who earlier had joined the Kikuyu Association. It had membership from all parts of the country. They demanded their land back. They wanted better working conditions and wages. They opposed the poll tax Africans paid. They did not like forced labour. Jomo Kenyatta was its secretary general in 1928. The return of their land. The release of Harry Thuku. Africans to be permitted to grow coffee and cotton. Africans to be given title deeds. An end to the kipande system. To protect the African culture from being changed by missionaries. To have the laws changed so that they reflect the wishes of the African people. To have an elected paramount chief rather than leaders chosen by the colonial administration that ended up serving their interests. The organisation started its own paper which it called Muigwithania or the “reconciler”. Jomo Kenyatta became the paper’s first editor. The party ran into problems when the colonial government banned any kind of fund-raising activities to support its work. There was also disagreement among its members which finally weakened it. It was finally banned in 1940. This organisation was started in 1922. To improve hygiene of people. To press for better education for Africans. To press for lower taxes. To end the kipande system. Before independence, the LegCo served the same purpose as the parliament today. After the Mau Mau uprising, the British realised that they needed to make changes in the political structure of the country. Some of these changes had to take place in the LegCo. LegCo was formed in Kenya in 1906. The first African to be nominated to the LegCo was Eliud Mathu in 1944. In 1957, the first elections for Africans were held and the following people were elected to the LegCo. These eight members of the LegCo formed a group called African Elected Members Organisation (AEMO). 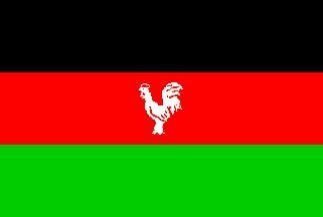 In 1960, KANU and KADU were main political parties. The First Lancaster House Conference was held in London. Lancaster House was the Headquarters of the British colonial office and representatives from the two parties attended. AEMO pressed for more representation of African in LegCo. African members in the LegCo pressed for independence. The LegCo played a great role in the production of a new constitution. Members of the LegCo formed political parties which later led Kenya to independence. It modelled people who later became Kenya’s prominent leaders. When the Second World War started in 1939 all political associations in the country were banned. Many Kenyan young men were recruited on the side of the British and Americans to fight in the war against Germany, Italy and Japan. Most of the African troops fought in the Horn of Africa and in Burma. During the war the British in Kenya realised that they needed to involve more Africans in the political development of the country. At the same time many political movements sprang up in Kenya to put pressure on the colonial government to grant independence. Kenyans who participated in the World War II learnt fighting skills and when they came back, they formed armed struggle. The war motivated Africans to fight for the struggle for independence. They learnt that whites were just like any other human being. They could also be defeated. This organization was formed as Kenya African Union in 1944. It was formed as an organization through which Africans could express their grievances. KASU was the first cross-ethnic political party. Harry Thuku was appointed its first president. The colonialists forced Africans to change the name of KAU (Kenya African Union) to KASU because they were threatened by the African unity. In 1945, James Gichuru became the president of KASU. The name of the party was changed back to KAU in 1946. KAU published a newspaper called Sauti ya Mwafrika. In 1947, Gichuru stepped down in favour of Jomo Kenyatta. To fight for self-government and democracy. To increase representation of Africans in LegCo. Better pay for African workers. Africans to get back their land and be issued with title deeds. It introduced a magazine called Sauti ya Mwafrika. It opened offices throughout the country and many Africans became members. It made Africans aware of their rights. It led to Mau Mau. KAU was banned in 1952 and its officials (Kapenguria six) were arrested. The Kapenguria six included Jomo Kenyatta, Paul Ngei, Bildad Kaggia, Fred Kubai, Kung’u Karumba and Achieng Oneko. It was started by former First and Second World War soldiers and service men. It started in central province. Mau Mau meant; Mzungu Arudi Ulaya, Mwafrika Apate Uhuru. It was led by Field Marshall Dedan Kimathi, Waruhiu Itote and Stanely Mathew. They wanted back their land. They were against kipande system. World war veterans had not been rewarded with land so they were not happy. They wanted freedom or independence. Their culture had been interfered with. 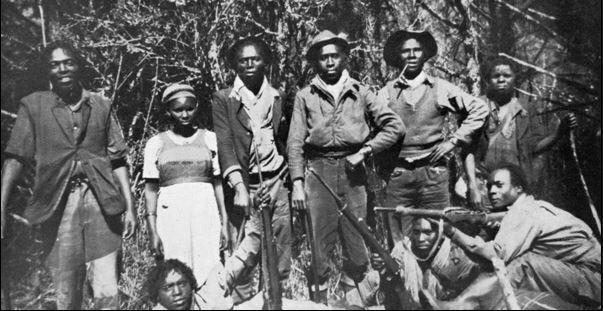 Below is an image of a Mau Mau gang. Many people lost their lives. Property was destroyed and houses burnt. Mau Mau supporters were arrested. British government accepted to discuss with Africans over representation in the LegCo. Mau Mau was defeated in 1954 and in 1960, the fighters surrendered. 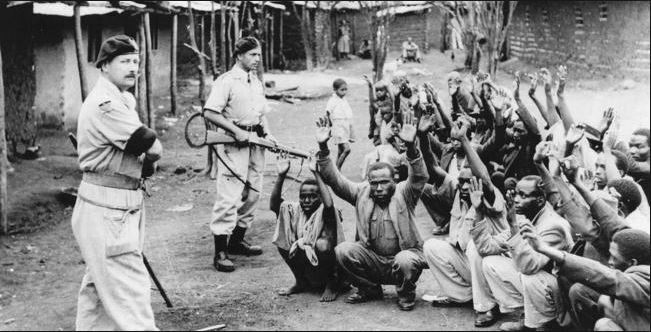 Below is an image of Kenyans rounded up by the British Army at the end of the Mau Mau uprising. To press for higher representation to LegCo. To change the country’s constitution. Later, James Gichuru stepped down in favour of Jomo Kenyatta after he was released. KADU was formed in 1960 at Ngong. They thought bigger tribes who were in KANU overlooked smaller tribes. They were pressing for independence. They mobilised Africans to fight for independence. They pressed for higher numbers of African representation in the LegCo. They led to the first ever democratic election in Kenya. They developed and nurtured future leaders. They pressed for the new country’s Lancaster constitution. KANU's logo is shown below.